Concrete finishers are often responsible for setting the concrete forms, ensuring they have the correct depth and pitch. Concrete finishers place the concrete either directly from the concrete wagon chute, concrete pump, concrete skip or wheelbarrow. They spread the concrete using shovels and rakes, sometimes using a straightedge back and forth across the top of the forms to “screed” or level, the freshly placed concrete. After leveling the concrete, they smooth the surface using either a hand trowel, a long handed “bull float” or powered floats. 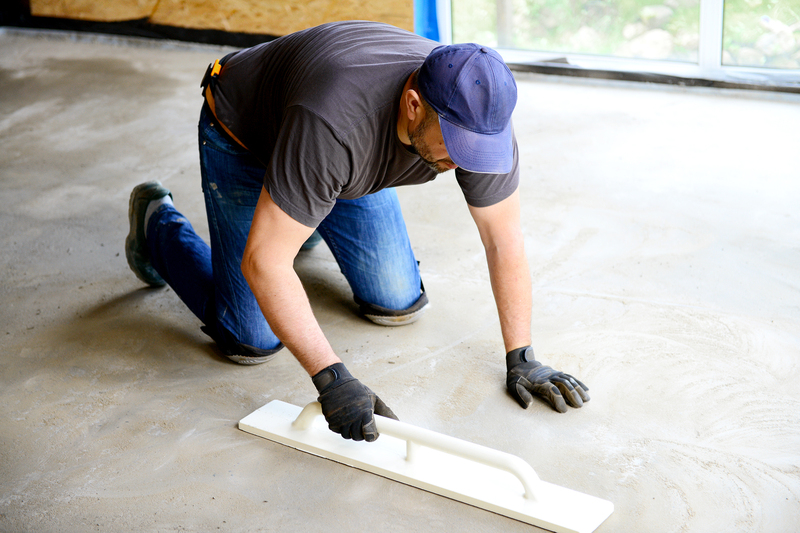 After the concrete has been leveled and floated, concrete finishers press an edger between the forms and the concrete to chamfer the edges so that they are less likely to chip. Broom and stamp finishes are a couple of different finished products for outdoor concrete after the trowel-finish is complete. The broom finish is used to prevent slipping on the concrete, and the stamp finish is used for looks.